Happy New Year, Kaiju Fans! Who was the Fandom’s Favorite Godzilla!? – SKREEONK! Happy New Year, Kaiju Fans! Who was the Fandom’s Favorite Godzilla!? Greetings from the year 2013 – Jon @ UnCanny here! As for the poll – we had 250 votes when the poll closed a month ago – Not bad! Here’s what the fans have to say, and I’ll admit the results are very surprising! As you can see to the left, expected candidates like Goji 54 and 62 came in with a good amount of votes, holding a respective 10% each, give or take. The real surprises come in with DAM and Megaro Goji – both coming out on top as well! Megaro Goji is a favorite of mine, but I thought I was in the minority there. Bio and Heisei Goji both gain an honorable mention as well, seeing as they both pulled a respectable 10% each as well. The winner is, however, a true underdog. Representing the heart of the Showa era – our winner is DAM Goji! With nearly 13%, a truly divided fandom gave one Godzilla the true title of King of the Monsters! Thats all for now, folks. I apologize for the absence at the end of 2012 there – things got crazy! I can assure you that the Marketplace will be going no where anytime soon, and that Skreeonk is here to stay! Take care of yourself Kaiju fans, and until next time! I was one of the 3 who voted for Gigantis.Gotta love the underdog. It’s great to have you back, Jon. Thank you, good sir! I’m happy to be back – Lots more to come in the future! 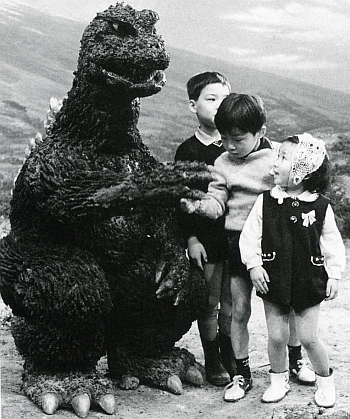 Next Post Happy Birthday, Godzilla! Previous Post Black Hole Aliens Invade Marmit and Old School Fan Films!